The Museum has a number of 18th-century auction catalogues of scientific instruments. 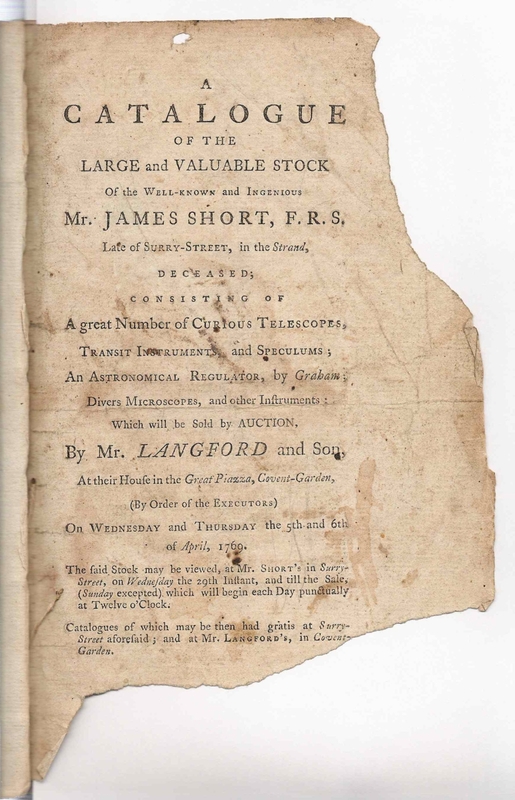 For example, there is an annotated copy of the sale catalogue of Benjamin Martin's stock in trade after his death in 1782. Dr Peter de Clercq has examined and transcribed from a series of photocopies of 18th-century auction catalogues in the library's collection. For a discussion of these documents, see his two-part paper 'Private Instrument Collections Sold at Auction in London in the Late 18th Century', Bulletin of the Scientific Instrument Society, 95 (2007), 28-36 (Professional Practitioners and Gentlemen-Collectors), and 100 (2009), 27-35 (Instrument Makers and Watchmakers). His transcriptions are available here as a 71 page PDF document. Scanned images of the auction covers can be seen below. Click on a caption to view a fullsize image. Note that only the covers are available as images; the full texts are available as transcriptions in the PDF document.